Thirsty Pilgrim: You Can Be My Saison Cowgirl. The beer is quaffable and has what I want just then: good old American, citrus-hop aroma. My nose also catches a big whiff of fresh paint – but that's not the beer. It is yet another addition to the now-sprawling complex that is the Delirium Café. In this case it's a new room in the Taphouse with enough tables for 60 more people. That's welcome news in a joint that still manages to get too packed and smoky at night. Naturally every inch of the new space is layered in more breweriana. 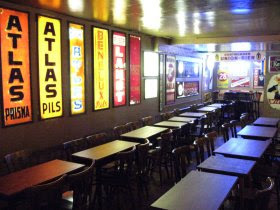 If you've ever tried to seek out an old Belgian beer sign and had difficulty, it may be because Delirium has them all. I'm especially fond of this one. As you may know I'm a bit of a saisonophile (yes, I just made that word up). I'd never heard of Saison Cow-Boy* until I saw this sign. 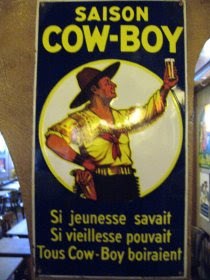 The translation is, "If the young knew, if the old could, they'd all drink Saison Cow-Boy." I think. That reminds me of an genius idea I had on the plane yesterday. It's a hypothetical beer name. 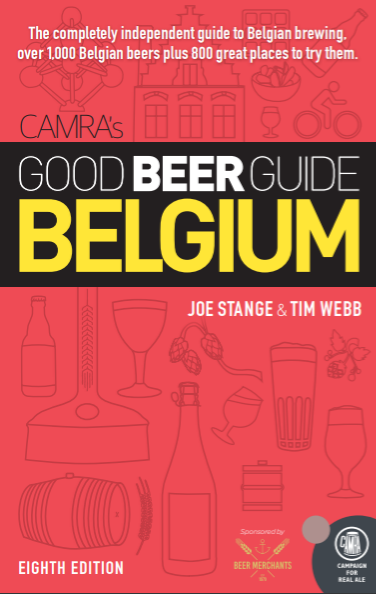 The next brewer to make a hoppy or sour American-Belgian hybrid can have it for free. Ready for it? "Ça C'est d'la Bonne Merde." It doesn't translate perfectly, but that's OK. Neither will your beer. *Made by Brasserie Ponselet, which was in the Hainaut town of Anderlues from 1836 until its closure in 1971. I'd love to know more about the beer, but there's precious little online except old labels for sale.